Avoid devastating company losses. Implement NFPA 75's state-of-the-art fire protection strategies for IT equipment. 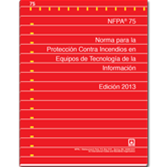 Updated and revised with a new name highlighting its focus on fire protection, the 2013 Spanish Edition of NFPA 75: Standard for the Fire Protection of Information Technology Equipment has the latest requirements for rooms or areas with computer installations needing fire protection, including suppression, detection, and building construction in what are often unique operating environments. Application is based on risk considerations including business interruption aspects of the functions -- such as storing or relaying banking, health care, or stock market information -- and the fire threat to the installation. Use the 2013 Spanish edition to preserve the efficacy of fire protection systems that may be adversely affected by aisle containment systems.